➢	to co-ordinate all the activities of the partners during the whole project to ensure the success of the project. The success of the network relies on making prompt and efficient decisions concerning technical, administrative and financial project matters. In this project, management decisions will be implemented through the project co-ordinator, local coordinators, the Work Package leaders and the Project Steering Group (PSG). 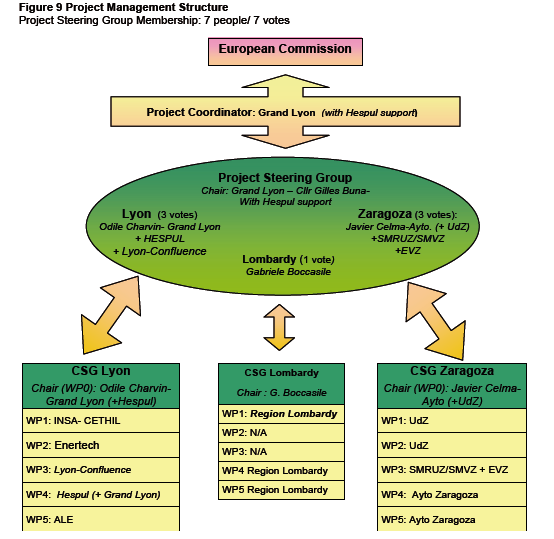 • To provide project management, leadership and co-ordination to the partner organisations taking part in the RENAISSANCE initiative and co-ordinate close and regular contact between the co-ordinator Grand- Lyon (assisted by Hespul) Ayto Zaragoza, assisted by UdZ and the Region of Lombardy. Both UdZ and Hespul will provide community based management and co-ordination. • To establish a project learning / communication network to allow document sharing and online collaboration for reports, shared work activities, etc. • To arrange (through Grand Lyon) regular payments to all project partners as defined in the pre-financing plan. • To oversee the work undertaken by the WP groups and to monitor progress by these groups and to collate and disseminate all initial, interim and final progress reports from each WP.